Look - it's endemic of the environment we work in that we can't review something with the words 'fantasy' and 'ring' in the title without sniggering. Despite the chucklesome name, the LG L1900R is a handsome panel. 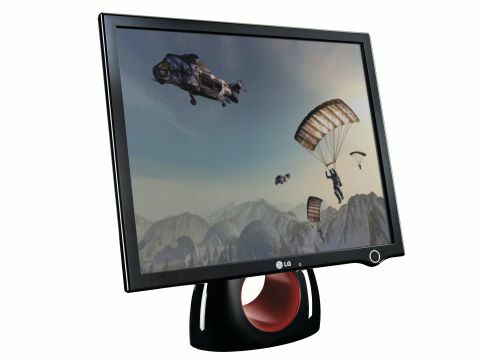 LG's Fantasy series is designed to bring a bit of style to your home PC, and with its obsidian shell, minimal buttons and red circle of light, we wouldn't be surprised if it reserved the right to veto any new background. It would certainly be a crime to inflict Bliss Hill on something so artful. The screen itself isn't too bad either. A bright and responsive 1280 x 1024 picture means that this stands up well during deathmatch in even the gloomiest of modern shooters. Arguably though, if you really want to go for the premium look, you'd have wanted LG to plump for a slick, glossy screen coating to match the shiny black the rest of the L1900R is swathed in, especially considering the price. LG's new panel is a sturdy and stylish addition to your home setup, and if you have a bit extra to spend on something you spend hours pointing your eyes at, your only jitters should be whether it'll embarrass the rest of your kit. If your PC is chic enough to complement it, then the L1900R is definitely a worthy choice.